When I recently shared the Cardamom Potatoes recipe, I mentioned that the recipe came from a stack of magazines and books that my sister sent me earlier this year from Italy. One of the books that she sent is a Savory Tarts & Quiches cookbook. 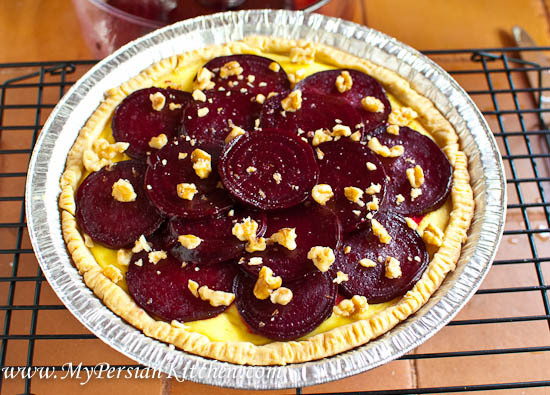 The very first time I was leafing through the cookbook, a recipe for “Feta Tart with Beets” immediately caught my eye. 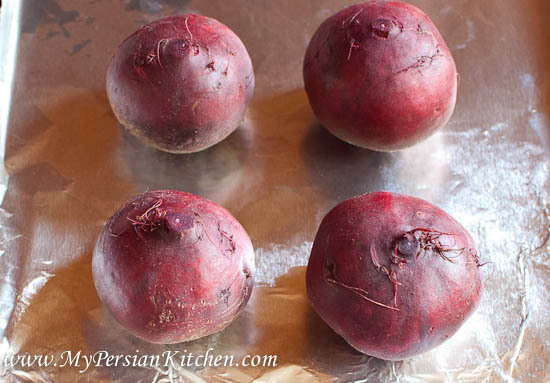 It is pretty safe to say that we Persians love beets and Feta cheese. In fact, I have expressed my love for beets here when I posted the Beet & Yogurt Hors d’oeuvre and Beet & Pomegranate Salad recipes. 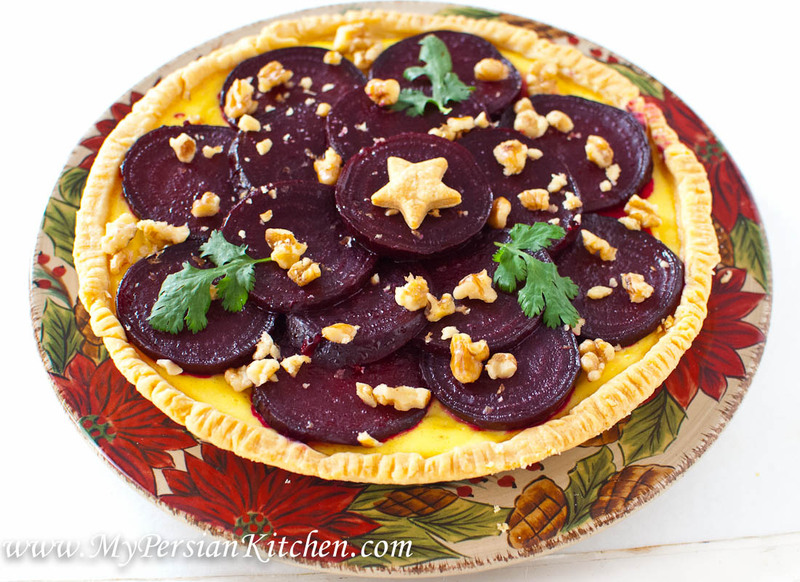 I think this tart is visually pretty and the flavors come together beautifully. It is not that hard to make and it’s a crowd pleaser. It is also perfect this time of the year as the colors are pretty festive. I made some changes to the original recipe and made my last run of it over the weekend for a gathering. I was very flattered that friends asked for the recipe. As a note, I decided to keep the amounts in grams. Brush beets clean. Place on a cookie sheet lined with aluminum foil. Rub all over with olive oil. Roast in a 400° oven for 1 hour until cooked all the way through. Once cooked allow to cool for about 5 to 10 minutes, then peel while still warm. Carefully, slice beets into 1/8 inch thick rounds. 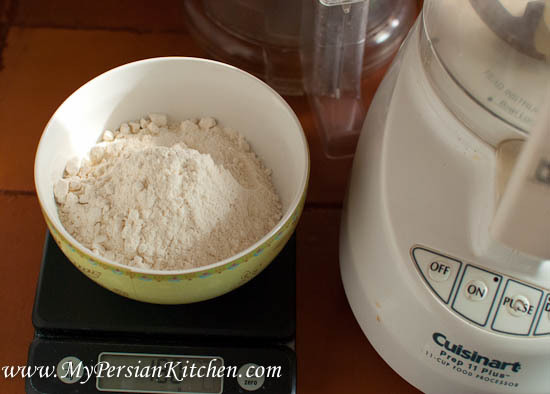 Measure out the flour and place in a food processor. 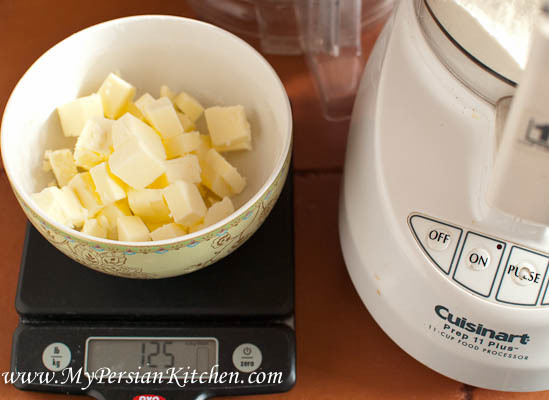 Cut butter into cubes and add to the flour. Add salt then run the food processor until the mixture turns into coarse meal. 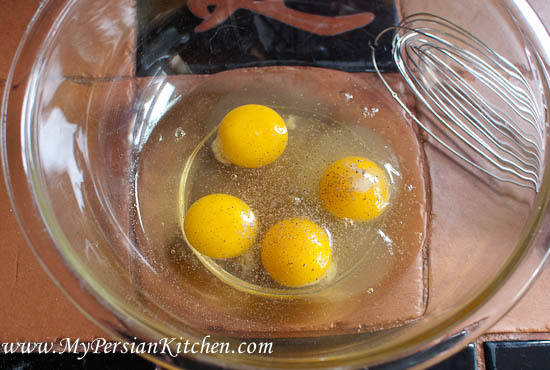 Add egg yolk and 3 tablespoons of cold water. Process again until the dough comes together and forms into a ball. 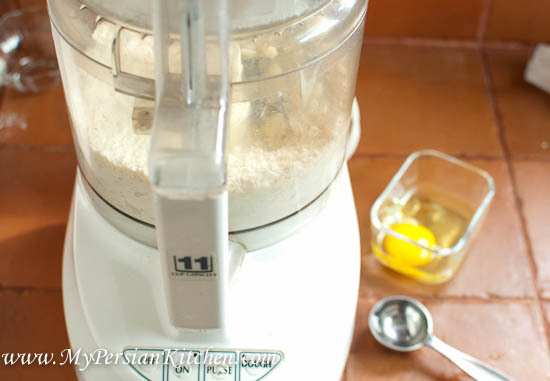 Remove dough from food processor and work into a disk. 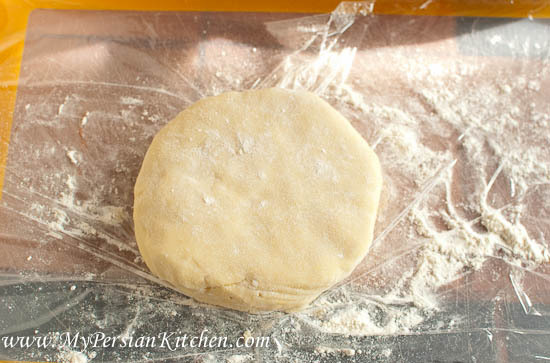 Place dough in a lightly floured plastic wrap and refrigerate for at least 1 hour. 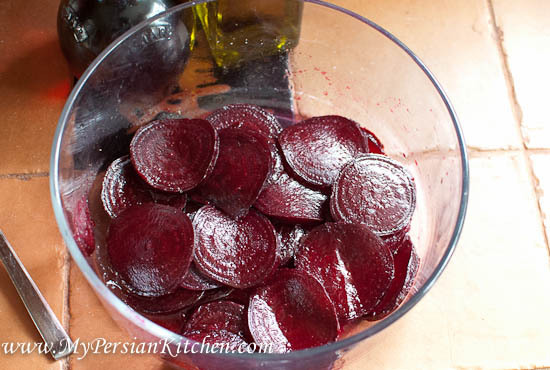 In a shallow bowl mix together 3 tablespoons of red wine vinegar and 2 tablespoons of olive oil. Season with salt and pepper. Mix well until salt is dissolved. 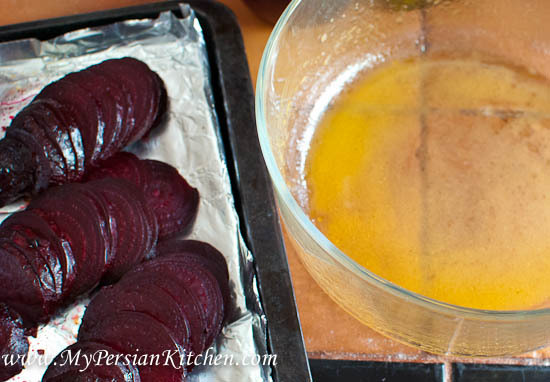 Add sliced beets and using your hands gently mix together so that each slice of beet is coated by the dressing. Cover and set aside at room temperature for at least one hour. 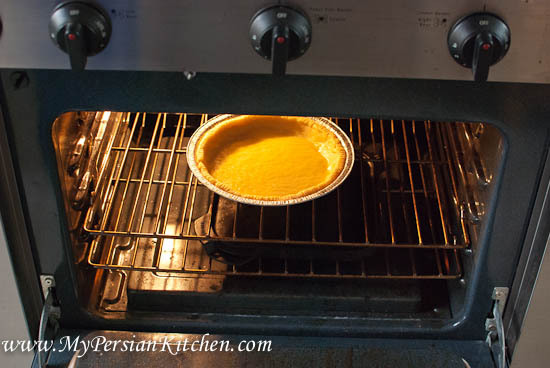 When ready to bake the tart, remove dough from fridge, then roll out. 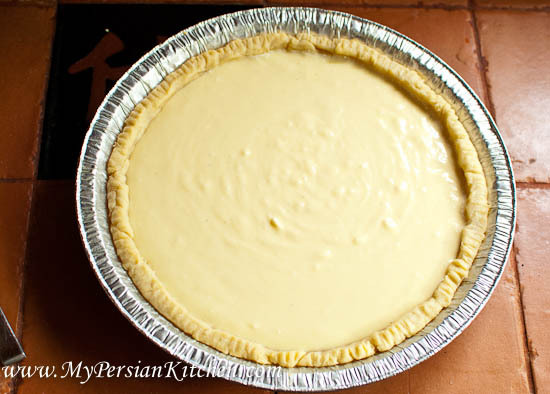 Place dough in a lightly buttered and floured 9 inch pie or tart pan. 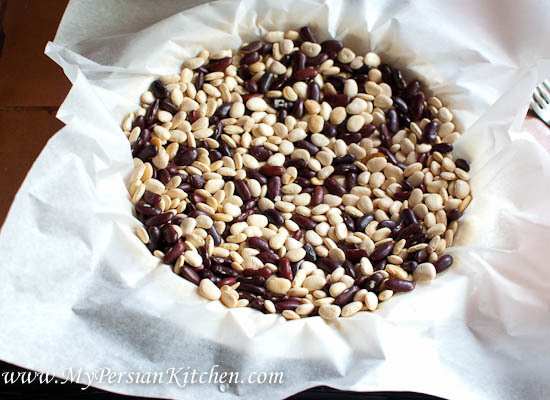 Place a sheet of parchment paper on top of the dough in the pie pan, then add pie weights or beans. Press down so that the dough does not rise while blind baking. Bake at 350° for 30 minutes. Remove parchment paper and pie weight. Place back in the oven for 10 minutes longer. In the mean time place eggs in a bowl. Season with just a dash of salt and a generous amount of pepper. Beat eggs. 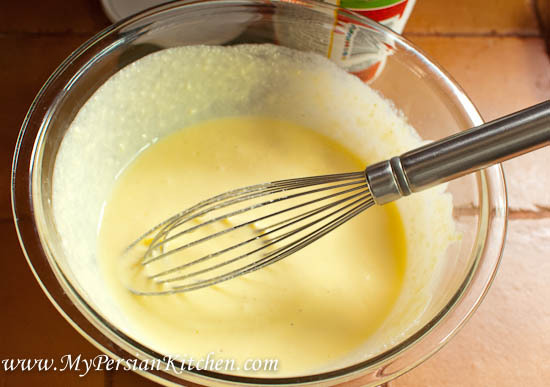 Add ricotta cheese and whisk until well incorporated and smooth. 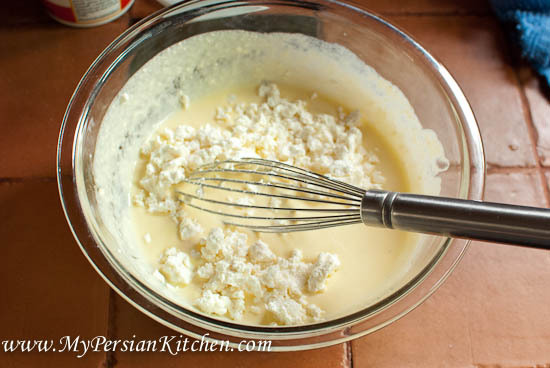 Add crumbled Feta cheese and mix well. Add ricotta and feta mixture to the tart crust. Shake gently so that the mixture is evenly distributed. At this point it is a good idea to cover the exposed edges of the crust with foil or a pie crust shield. Return to oven and bake for 45 minutes longer or until the filling is firm. Remove tart from oven and immediately arrange beet slices on top. Just before serving add rough chopped walnuts on top. This tart is best when served warm.